Testimonial Builder puts the power of video marketing in your hands. 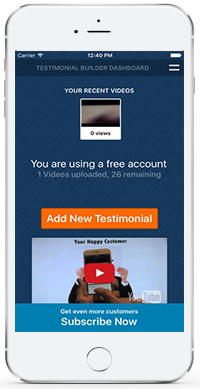 Easily Create Videos of Your Satisfied Customers and Share them with The world! Google uses videos posted on Youtube to Increase Search Ranking. This means if you make and post videos of your happy customers, your company will rank higher and new customers will see authentic reviews from happy Customers. Our Testimonial Builder Program helps you do just that with ease. Our Free Iphone app alows you to record your happy customer at the point of sale. The app includes a teleprompter to tell you what to say. The app has a keyword manager to tag your video and it uploads the video for you. Now that is easy. A Good Online Reputaion obviously can help you get customers. But keeping a good reputation has been a passive act, hoping people will take the time to give you four or five stars somewhere and hoping people belive the written testimonial is a real person. Video Testimonials are the best way to improve your dealership's image. There is nothing more powerful than a real testimonial from a happy customer. Capture video testimonials from happy customers at the time of delivery. Seamlessly integrate the testimonials into your marketing, website to build online exposure and increase sales. Share your customers' positive experiences with our free app available on the iPhone and iPad.